For more posts on homeschooling, see here. Practice drawing straight lines - I tried to get her to draw straight lines on her Colour Doodle but she was having none of it really. She drew a few but then got really bored and just wanted to draw pictures. Sing the alphabet song - We sang the song together and I tried to correct her pronunciation a bit without making it no fun. She still struggles with the middle of the song so I'm going to keep on so she picks it up as we go. Read a book during the day - We read Victoria Plum has a party and Babies. Count to 15 - I'm going to have to think of some ways to get her to count 1-15 because I know she can do it but she just gets bored and makes mistakes because she's not paying attention. Colours and shapes - We practiced our shapes and colours again, she knows rectangle now!! It took her a while but she got there in the end. I'm so proud of her :) She's known her colours and the rest of the shapes for a while now so we just reinforced those. Read a bedtime story - We did read a bedtime story but I can't for the life of me remember what I read them *blush*. The rest of the week was a write off because the kids have been pretty ill. They have bad colds and blocked noses and keep randomly breaking down in tears. I don't want to push Leyla too much while she's poorly so we just had a lazy week. To be fair though, everything I had on the list for September she's finished already so I'm debating doing things a bit different next month. I feel a bit guilty that Naomie can't join in with a lot of the things I've been doing with Leyla aswell so I might add more ''learning play'' that Naomie can join in with too next month, maybe a 1 day lessons, 1 day play kind of deal? This morning the kids were feeling a bit better so I broke out the Mega-Bloks for them and they had a fun time with that. 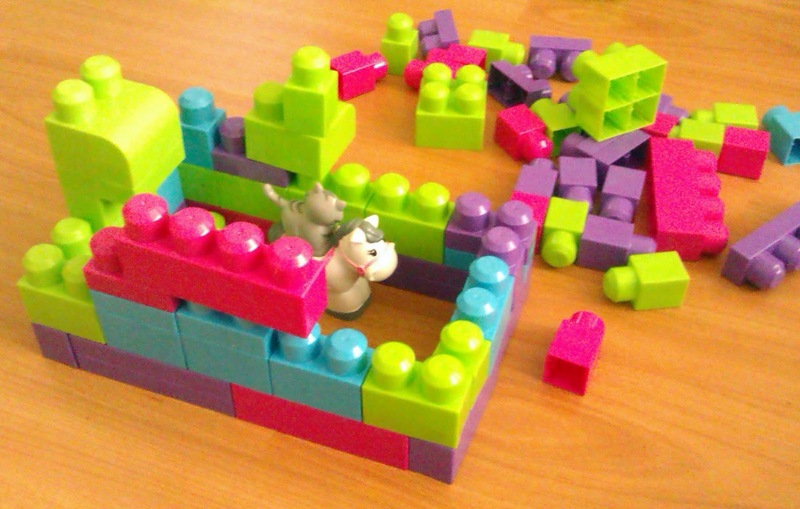 Leyla built a castle (I built the first row as a base then she added more on top). She put a horse and a cat inside that she got in the pack and then asked me whether she could go in. I told her she was too big to go inside really so she asked whether Naomie was too big haha. We worked out that she could just about fit her foot in and she got really excited about that. Naomie is still too small to be building so I just gave her some blocks already built up to play with. When we had finished Leyla's castle, Naomie came in and pulled it all down haha. So helpful she is!